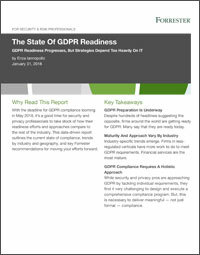 With the deadline for GDPR compliance looming in May 2018, it’s a good time for security and privacy professionals to take stock of how their readiness efforts and approaches compare to the rest of the industry. This Forrester report is licensed by Dataguise for a limited time only. Complete the short form to access it now.